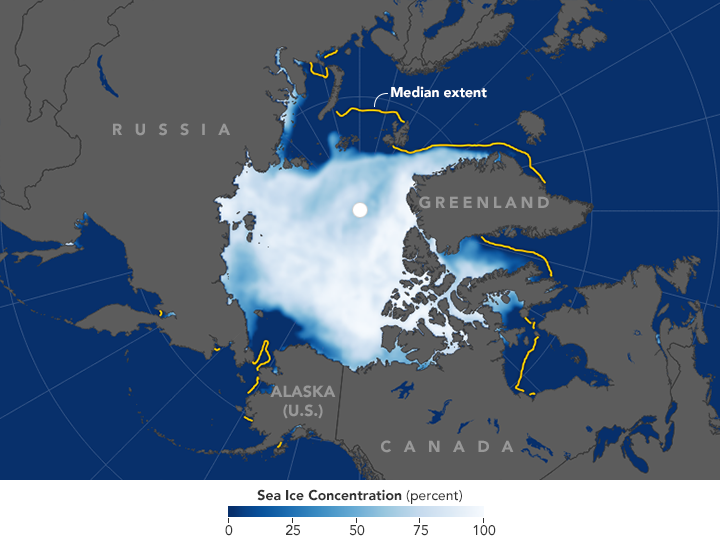 Every northern fall and winter, cooling ocean and air temperatures cause the floating cap of Arctic sea ice to grow from its annual minimum extent toward a maximum between February and April. So far in 2016, though, the Arctic Ocean and neighboring seas have been slow to freeze, setting both daily and monthly record lows. “The October freeze-up was very slow and that continued through much of November,” said Walt Meier, a sea ice scientist at NASA’s Goddard Space Flight Center. 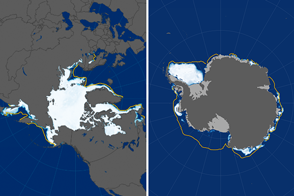 In November, the sea ice extent averaged 9.08 million square kilometers (3.52 million square miles)—the lowest November extent in the satellite record. The yellow line shows the median extent from 1981 to 2010, and gives an idea of how conditions this November strayed from the norm. 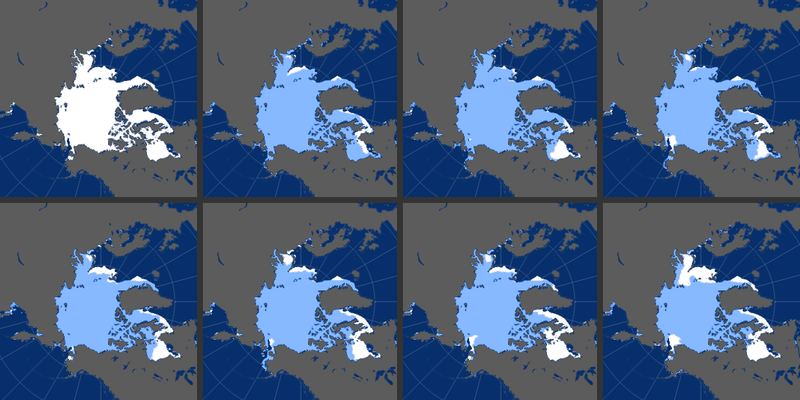 Years with sea ice above and below the median are displayed in the grid view. 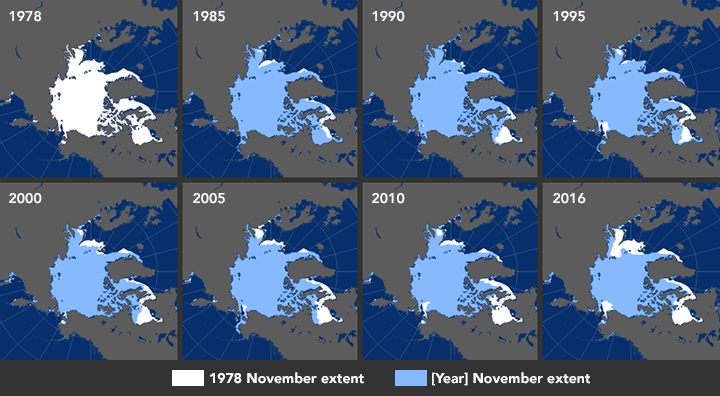 The eight panels show the November extent roughly every five years since 1978, when satellites started monitoring sea ice. Every November is different, as freeze-up is influenced by factors such as water temperature, air temperature, and wind patterns. All three factors played a role in the November 2016 record low. The progression of the freeze-up is detailed in the next graph, which charts the daily extent of sea ice in 2016 and every year since 1979. After reaching the annual minimum on September 10 (the second-lowest on record), sea ice started to quickly refreeze during the latter part of the month. October was a different story; ice growth slowed substantially and started setting record daily lows. Freezing picked up again, but it was not enough. The sea ice extent in October 2016 was the lowest of any October in the satellite record. November was no better, setting record lows each day. Freezing that quickened near the start of the month was interrupted by a period of melting that lasted several days. Finally, ice resumed a faster growth rate during the last week of the month. A key reason for the record lows is a warm ocean. 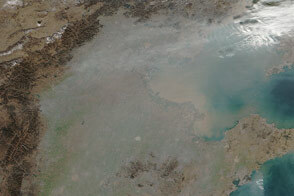 During the summer, large expanses of dark, ice-free Arctic water were absorbing solar energy and warming. 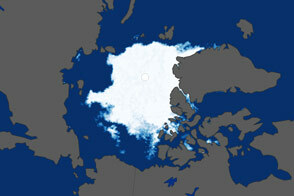 Until that heat escapes to the atmosphere, sea ice cannot form. 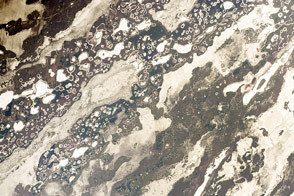 NASA Earth Observatory images by Joshua Stevens, using data from the National Snow and Ice Data Center. Caption by Kathryn Hansen. The seasonal freeze-up in the Arctic Ocean and neighboring seas has been very slow, setting both daily and monthly record lows. 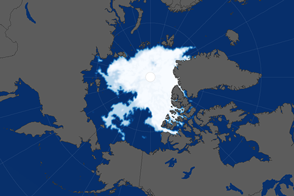 National Snow & Ice Data Center (2016, December 6) Sea Ice Hits Record Lows. Accessed December 6, 2016. 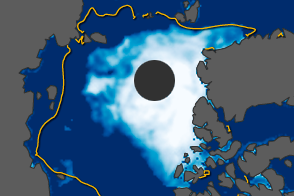 National Snow & Ice Data Center (2016) Arctic Sea Ice News and Analysis. Accessed December 5, 2016.